The Favorites is a series briefly exploring films I love, to find out what makes them - and me - tick. Late Spring (1949/Japan/dir. Yasujiro Ozu) appeared at #78 on my original list. What it is • In postwar Japan, 27-year-old Noriko lives in a cozy arrangement with her father, situated perfectly between the travails of the past and the uncertainties of the future. Life is a series of pleasant household chores, refreshing excursions to a Tokyo museum or the beach (whose looming Coca-Cola sign, along with Noriko's slacks and sweater, stand as a modern/Westernized contrast to the traditionally-dressed tea ceremony that opens the film), and playful, bantering conversations with old friends and relatives. The film deceptively thrusts us into this particular moment in Noriko's life, lulling us into believing that this is how it has always been, and always could be. But in fact the situation is tenuous and fleeting. Noriko has only just recovered from an illness incurred during the harsh years of the war and she is expected to marry. She has no skills that she could apply outside of the home (her friend, an independent divorcee working as a stenographer, chides her wanting a job of her own). But Noriko doesn't want to marry and her father, at least until he is pressured, does not seem especially eager to lose her either. They have a close bond and we sense that all the unspoken tragedies of the past - her mother's death, the harshness of the war years, the poverty and humiliation of occupation - have only forged their desire to remain within a comfortable cocoon. Miraculously, as with much of Yasujiro Ozu's work, the placid, soothing surface of what we see both conceals and suggests the storm offscreen. The film is as deeply wise as it is seemingly simple, and with that wisdom comes both sadness and acceptance. The arrival of the late spring is little comfort for those who enjoyed their hibernation. Many entries on this list depict transformation. But unlike, say, Platform this film does not sweep across history, registering a change so dramatic that it is dizzying. Instead, Late Spring emphasizes the glacial nature of Noriko's journey from daughter to bride. This is what lends the movie its particularly touching quality. In any given scene we may notice the writing on the wall, but that doesn't take away from the moment at hand. The immersion in the present is captured in Ozu's use of the pillow shots (empty landscapes or "establishment" shots that are less about setting the place than setting a mood) and his leisurely pacing of domestic activity while his achingly gorgeous compositions - shooting through multiple doorways, framing the activity of one room while situated in another - suggest a larger continuity of time at work, focused on the detail without losing the bigger picture. Something about this feels magical to me, like a home movie orchestrated by a master filmmaker. The first time I saw Late Spring, even having already experienced avant-garde features like Persona, I didn't quite know what to make of it. Its story was so casual and low-key, its rhythms so gentle and unobtrusive that I wasn't sure what it all added up to. I was particularly perplexed by the visit to the Noh Theater, which from a 21st century American standpoint seemed completely impenetrable. But Late Spring's minor key conceals major themes, and somehow the impression of the film lingered, especially that final sequence in which Noriko's father drops an apple he has just finished peeling - a slow task that is now emphatically over, an apt metaphor for the movie's entire story - and looks as if he is going to weep. (We don't see him do so, nor do we need to, and maybe he himself wouldn't even go that far: the gesture is enough to give expression to the feeling.) I kept coming back to the movie, learning to savor the stillness and the bustle, the tactile nature of Ozu's world. Roger Ebert writes a powerful, blunt treatment of the film expressing its entire dramatic movement as a profound tragedy in which two people who love each other deeply are separated by society. Norman Holland argues that in fact Noriko should marry and that her father is rightly concerned for her future, however sorry he is to lose her. There isn't one set way to feel about it and why should there be, when the characters themselves aren't sure how to balance responsibility and reassurance? To borrow and flip Hitchcock's phrase, Ozu presents life with the boring bits left in, but here the boring bits are made beautiful. And weren't they always, really? How you can see it • Late Spring is available from the Criterion Collection on Netflix and Hulu (check this site for future digital or streaming availability). I included a clip at 5:20 in Noir and Naturalism (chapter 8 in my 32 Days of Movies video series). What do you think? • What were your first impressions of Ozu? Did watching his earlier work change your impression of his later films? 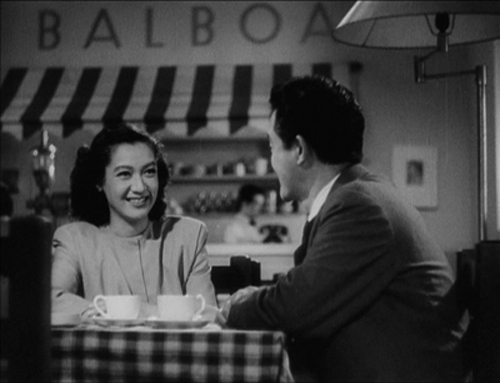 What is your favorite performance by the late, great Setsuko Hara? Do you see Late Spring and Early Summer as complementary, or contradictory despite their many similarities? In Late Spring, do you agree that it was best for both Noriko and her father for her to get married? Do you think their relationship was healthy or too dependent upon one another? Do you think that, had Noriko played her cards differently, she could have married her friend (perhaps breaking his engagement)? Would either of them have been happy if she had? What is your favorite small moment in the film? Which small moment do you feel is in fact the most momentous? Do you think Late Spring is a tragedy? Are any Ozu films tragedies, and if so which ones? Do you prefer Tokyo Story, often put forward as Ozu's masterpiece? What do you see as the fundamental differences between that and this film? Do you think the recent history of war, defeat, and occupation haunt Late Spring and where do you see their traces?